I could go on and on about the benefits of fermented foods. 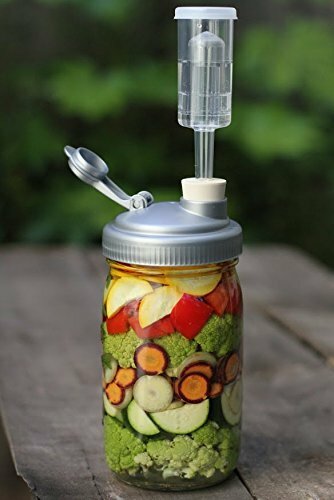 Besides providing probiotics to your system, enhancing immune function, and helping your digestion, fermenting veggies is a great way to preserve foods and give them a bit of a longer shelf life! PLUS, and most important, they are DELICIOUS! 4. Dill, fresh or dried (fresh dill looks really cool in the jar), about a teaspoon or so.. If using fresh dill, one or two sprigs will be plenty. This is whey! Click on the link above or farther down for directions how to make it. You don't have to use it, though. I just prefer to. 1. A large jar---this could be a Mason jar (quart size) or other wide mouthed jar. If you are using a quart size Mason jar, you may need to split the recipe between the jars. 1. Boil some water in a large pan. 3. Immediately place the beans in ice water or very cold water to stop the cooking process. 4. Add half the spices (garlic, peppers, and dill) to the jar. 5. Lay the jar on its side and pack the beans in sideways. This will help keep them vertical in the jar. 6. Using room temperature water, add 3 tablespoons salt to 4 cups filtered water. You will probably have a little too much, but that is ok---better to have too much than too little. This is the brine. 7. Dissolve the salt completely in the water by stirring. Again, be sure the water is room temperature or so. 8. Pour the brine (water and salt liquid) over the beans. 9. Add the rest of the spices to taste. 10. Add about 1/4 cup of whey if you want and if you have it. It will speed up the fermentation process. I usually use it, but I know of many others who never do. Here is how you can make your own whey. 11. Be sure the veggies are completely submerged in liquid. If they are not, just add a little more brine. 12. Cover with a lid. Now it just has to ferment for several days! This is the fun part! If you plan to use a regular lid (like I am in the pictures), plan to "burp" your ferment two to three times a day. To do this, just open the lid slightly. You will hear and feel the gases escaping, and after the second day or so, you will start to see lots of bubbles coming to the surface! It's pretty cool! After about 3 to 4 days (I usually leave my ferments even longer---sometimes 2 or 3 weeks, depending on how they are looking/tasting), have a little taste test! When you like the taste, just refrigerate! This will slow down (but not stop completely) the fermentation process. These will last in the refrigerator for several months, however, I think they will be gone LONG before then! You can can fermented foods. That is what most of the sauerkrauts on the grocery store shelves are. I don't recommend it though. It kind of defeats the purpose because the extreme heat used during the canning process will kill off all the probiotic goodness of fermented veggies. I opt NOT to can fermented foods, but you will need cold storage (an area that hovers around 50 degrees or below). So I just use the 'fridge. Do you ferment any foods? I'd love to know! P.S. Remember to sign up for the HHH Newsletter! You can buy all kinds of DIY kits for various fermenting projects HERE. Another note: There are affiliate or sponsored links in this article. If you happen to click through and make a purchase it will not cost you a thing, and you will be helping me keep up my blogging activities! I'd LOVE to hear from you!!! You can email me if you don't want to leave a comment below. Either way, I will get back to you! Have you fermented green beans before? How did they turn out? Sep 1 The BEST Handmade Deodorizing Spray & Cleaner...Amazing! Oct 24 Make Fermented Tomatoes! Filled with Probiotic Goodness and SO Delicious!